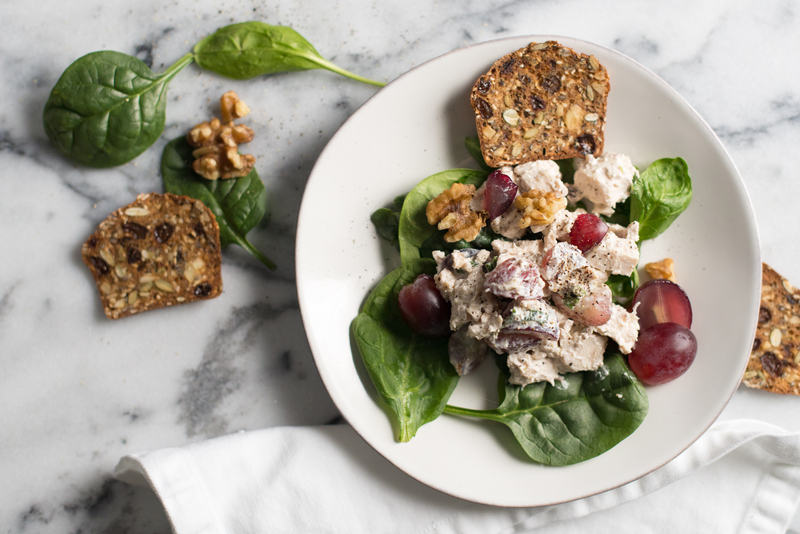 Believe it or not, this creamy chicken salad is as healthy as it gets. Using lowfat yogurt for the bulk of the dressing gives it a tangy creamy taste which is nutritious and rich-tasting at the same time. Adding the fruits and veggies makes it interesting and packs in more nutrition. Feel free to improvise other favorite chicken salad ingredients like pecans, raisins, celery and apples. Cook the chicken several hours before (I made mine the night before). Serve on lettuce, whole wheat bread or pita bread. You can certainly try making this without mayonnaise, but I found that the mayonnaise does enhance the flavor. Instead of traditional Miracle Whip or mayonnaise, I used a product called “Nayonaise” which is a soymilk based, egg-free alternative. It has a little sweet-sour kick like Miracle Whip with about half the calories. I found it in the “Nature’s Market” section of our Wegman’s Grocery Store. Bring chicken broth, water, and chicken breasts to a simmer and cook with lid on for about 8 minutes. Turn off heat and continue to let cook with lid on for another 20 minutes. Make sure chicken is cooked through, discard liquid, and refrigerate until cool. Dice chicken into 1/2 inch cubes. In a medium bowl whisk together yogurt, mayonnaise, mustard and honey. Toss chicken, grapes, onions, walnuts and chives in dressing until well-coated. Season with salt and pepper to taste.